Blood monocytes are well-characterized precursors for macrophages and dendritic cells. Subsets of human monocytes with differential representation in various disease states are well known. In contrast, mouse monocyte subsets have been characterized minimally. In this study we identify three subpopulations of mouse monocytes that can be distinguished by differential expression of Ly-6C, CD43, CD11c, MBR, and CD62L. The subsets share the characteristics of extensive phagocytosis, similar expression of M-CSF receptor (CD115), and development into macrophages upon M-CSF stimulation. By eliminating blood monocytes with dichloromethylene-bisphosphonate-loaded liposomes and monitoring their repopulation, we showed a developmental relationship between the subsets. Monocytes were maximally depleted 18 h after liposome application and subsequently reappeared in the circulation. These cells were exclusively of the Ly-6Chigh subset, resembling bone marrow monocytes. Serial flow cytometric analyses of newly released Ly-6Chigh monocytes showed that Ly-6C expression on these cells was down-regulated while in circulation. Under inflammatory conditions elicited either by acute infection with Listeria monocytogenes or chronic infection with Leishmania major, there was a significant increase in immature Ly-6Chigh monocytes, resembling the inflammatory left shift of granulocytes. In addition, acute peritoneal inflammation recruited preferentially Ly-6Cmed-high monocytes. Taken together, these data identify distinct subpopulations of mouse blood monocytes that differ in maturation stage and capacity to become recruited to inflammatory sites. Circulating peripheral blood monocytes provide a mobile source of functionally competent cells of the innate immune system. They are constituents of the mononuclear phagocyte system, which encompasses various subtypes of dendritic cells (DC)4 and macrophages as well as their precursors (1, 2). Different subtypes of monocytes in humans can be distinguished according to their expression of CD64 or CD14 and CD16 (see Ref.3 for review). These subtypes both develop into macrophages or DC in vitro, but their developmental relationship is still unclear. Furthermore, differences in the occurrence of specific subsets in various disease states, such as systemic inflammation, suggest that monocyte subpopulations also are functionally specialized (3). Compared with what is known about the human system, knowledge about mouse monocytes is much more limited. Bone marrow (BM) monocytes have been shown to develop into mature macrophages in vitro as well as in vivo (4, 5). In addition, at least a fraction has the potential to develop into DC (6, 7, 8). Monocytes can be identified in the BM on the basis of high level expression of Ly-6C (ER-MP20) and the absence of CD31 (ER-MP12), but an exclusive marker for mouse monocytes in the BM or the bloodstream is not yet available (4, 9, 10). Characterizing peripheral blood monocytes, Lagasse and Weissman (11) and, more recently, Henderson et al. (12) showed peripheral blood monocytes to be a homogeneous population. Nevertheless, experiments conducted by Palframan et al. (13) and Geissman et al. (14) using CX3CR1GFP/+ mice indicated that peripheral blood monocytes in these mice also encompass subtypes, differing in CX3CR1, CCR2, and CD62L expression. Interestingly, the monocytes expressing CCR2, CD62L, and low levels of CX3CR1 appeared to be preferentially recruited to inflamed peripheral sites by virtue of their recognition of CCL2/monocyte chemoattractant protein-1 and the CD62L-mediated interaction with high endothelial venules. Conversely, the CX3CR1high monocytes migrated into noninflamed sites (14). The goals of the present study were to identify and characterize the putative subpopulations of monocytes in normal mouse peripheral blood with respect to phenotype and function and to establish their hitherto unknown developmental relationship. The initial criteria used to distinguish monocytes from other leukocyte types were their mononuclearity, which is read as low orthogonal (side) scatter in the flow cytometer, and their myeloid nature, as indicated by high level expression of CD11b/Mac-1. Additional required characteristics were high phagocytic capacity and the ability to develop into macrophages upon stimulation with M-CSF. Our results show that distinct subpopulations of monocytes can be identified in steady state peripheral blood of normal mice by differential expression of various surface markers, in particular Ly-6C (ER-MP20). Ly-6Chigh monocytes are recent immigrants from the BM and have the capacity to migrate into sites of peripheral inflammation. In contrast, Ly-6Clow monocytes have lost this potential. Moreover, we show that Ly-6Chigh monocytes mature in the circulation and are the precursors for Ly-6Clow monocytes. As the reported experiments comprise a collaborative effort among three different laboratories, materials and methods differed slightly between experiments performed at different locations, as indicated. However, results were validated by repetitions of experiments and extensive comparisons between our laboratories. All data shown are representative of at least three independently performed experiments. Specific pathogen-free C57BL/6J female mice were purchased from The Jackson Laboratory (Bar Harbor, ME), Charles River (Sulzfeld, Germany), or Harlan (Horst, The Netherlands) and were housed in microisolator cages and given mouse chow and water ad libitum. Mice were 8–16 wk of age when used in experiments. All experiments with mice were performed with the approval of the animal care and use committees of Veterans Affairs Medical Center (Oklahoma City, OK), Erasmus Medical Center (Rotterdam, The Netherlands), or the State Review Board of Munster (Germany). Specifications of mAbs and fluorescent conjugates against surface markers used in this study are listed in Table I⇓. Directly conjugated isotype control mAb were purchased from BD PharMingen (San Diego, CA). Anti-rat IgG conjugated with FITC was obtained from Dianova (Hamburg, Germany). Listeria monocytogenes strain EGD was stored in brain heart infusion broth (Difco, Detroit, MI) at 109 CFU/ml at −70°C. For experiments, 10 μl of stock culture were inoculated into 4 ml of broth and incubated overnight at 37°C with shaking. An aliquot of the overnight culture was diluted 1/10 into fresh broth and cultured an additional 4.5 h. Bacteria were diluted to the desired concentration with sterile PBS before injection. Leishmania major (World Health Organization nomenclature: MHOM/IL/81/SE/BNI) were maintained by monthly passages in BALB/c mice. Promastigotes were grown in a 5% CO2 atmosphere at 25°C in Schneider’s Drosophila medium (Promocell, Heidelberg, Germany) supplemented with 10% FCS, 2% human urine, glutamine, and HEPES buffer, with penicillin and streptomycin as antibiotics. Mice were infected i.p. with 5.1 log10 CFU (1–2 LD50) of L. monocytogenes or by s.c. application of 2 × 107 promastigotes (stationary phase) of L. major in 20 μl of PBS into the left hind footpad. Animals were sacrificed, and blood was harvested 24, 48, and 72 h after L. monocytogenes infection or 3 wk after L. major infection. In other experiments, sterile inflammation was induced by injecting mice i.p. with 1.0 ml of sterile FCS (HyClone, Logan, UT). Inflammatory peritoneal exudate cells were harvested 24 h later. Mononuclear phagocytes were eliminated in vivo by i.v. injection of 0.2 ml of dichloromethylene-bisphosphonate (clodronate) liposomes into the lateral tail vein, as described previously (15). Clodronate was a gift from Roche (Mannheim, Germany) and was incorporated into liposomes as previously described (16). As an alternative approach, mononuclear phagocytes were labeled in vivo by i.v. injection of PBS-containing liposomes that were labeled with DiI or DiD (Molecular Probes, Leiden, The Netherlands). Mice were euthanized with an overdose of ketamine (2 mg; Parke-Davis, Berlin, Germany; or Morris Plains, NJ) and xylazine (0.2 mg; CEVA Tiergesundheit, Dusseldorf, Germany; or Vedco, St. Joseph, MO) or by CO2 exposure. Blood was obtained by axillary or femoral artery puncture or by heart puncture after exposing the organ and was collected in heparin-coated tubes or in syringes containing 1.0 ml of PBS with 8 mM EDTA. Control experiments showed that similar results were obtained by either method of exsanguination and anticoagulation. Erythrocytes were lysed using ACK lysis solution, and then leukocytes were washed twice by centrifugation at 250 × g in DMEM (Life Technologies, Gaithersburg, MD) containing 5 mM EDTA and 0.5% BSA. Peritoneal cells were collected 18–24 h after induction of inflammation by lavage with 8 ml of sterile iced PBS and were similarly prepared for further analysis. Aliquots of ∼106 cells in 1% BSA in HBSS (Biochrom, Berlin, Germany; or Life Technologies) were put into 96-well microtiter plates and then incubated with unlabeled mAb or directly conjugated primary mAb for 30 min on ice. In experiments using PE-Cy5-conjugated mAb, the cells were first incubated with 3% normal mouse serum and anti-CD16/32 mAb (BD PharMingen) for 30 min on ice before addition of directly conjugated mAb to block nonspecific binding. After the first incubation, the cells were washed three times and then incubated with fluorochrome-conjugated secondary Abs as needed. Controls included cells incubated with or without fluorochrome-conjugated control Abs and with unspecific isotype Ab, followed by fluorochrome-conjugated secondary Abs as needed. The cells were analyzed using a FACSCalibur equipped for four-color flow cytometry. Each measurement contained a defined number of 2 × 105 cells. Data were analyzed using CellQuest (BD Biosciences, Mountain View, CA) or WinMDI 2.8 software. Cell sorting was performed on a Moflo High Speed Cell Sorter and Analyzer (Cytomation, Ft. Collins, CO) with data acquisition using CyCLOPS version 2.1 software (Cytomation). For morphological characterization of sorted cells, at least 2 × 104 cells from each population were sorted into FCS-coated plastic tubes filled with 2 ml of HBSS. Suspensions of freshly sorted cells were cytocentrifuged onto slides, air-dried, and then fixed with equal parts ethanol/methanol. Differential counts, according to the morphological criteria established previously (10), were performed on May-Grünwald-Giemsa-stained cytospin preparations of peripheral blood leukocytes and blood smears by counting at least 200 cells/cytospin or blood smear at ×400 magnification. For analysis of in vitro development of sorted populations, 6–9 × 104 cells from each population were collected into 24-well glass tissue culture chambers (Nunc, Roskilde, Denmark). To test for macrophage development, cells were seeded at a density of 1 × 103 or 2 × 104 cells/ml in DMEM supplemented with 10% heat-inactivated FCS, 10% L cell-conditioned medium (as a source of M-CSF), l-glutamine, kanamycin, and nonessential amino acids. The cells were incubated at 37°C with 7% CO2 for 1–8 days, after which time they were fixed and stained for differential counting as described above. Adherence and proliferation of cultured cells were evaluated daily with an inverted microscope using an ocular with eyepiece graticule. When several cells were found in close contact with each other and distinctly separated from neighboring cells, they were referred to as groups of 2–10 cells, clusters of 10–50 cells, or colonies when counting >50 cells. Phagocytic activity was quantified by adding 2.5 μl of a suspension of 5.4 × 109 latex particles/ml with an average diameter of 0.81 μm (Difco) to adherent cells on 24-well plates for a final ratio of cells to latex particles of 1:14. Cells and latex particles were incubated for 4 h at 37°C and then fixed with ethanol/acetone (50/50, v/v). In some experiments, phagocytosis was studied using L. major promastigotes. For this, freshly sorted cells were coincubated with promastigotes for 4 h at a ratio of 1:5. Cells were washed and fixed in ethanol/acetone (50/50, v/v), and phagocytosis was quantified after staining with May-Grünwald-Giemsa. Cells were examined by light microscopy at ×200 and ×400 for the presence of intracellular parasites or ingested latex particles, respectively. To establish the flow cytometric identification of monocytes in normal mouse peripheral blood, we hypothesized that monocytes should be distinguishable from granulocytes and lymphocytes by their lower granular content, as reflected in low SSC, and their high level expression of Mac-1/CD11b (4, 10, 11). To test this, we sorted different peripheral blood subsets based on SSC and Mac-1 expression (Fig. 1⇓A) and determined which population contained monocytes. Morphological characterization by May-Grünwald-Giemsa staining showed that 95% of SSClowCD11bhigh cells were monocytic (see below). In addition, we observed that almost 95% of SSClowM-CSF receptor+ (M-CSF R)+ cells could be found within the CD11bhigh window (Fig. 1⇓A), suggesting that virtually all monocytes were contained in this population. When sorted, these SSClowCD11bhigh cells became adherent when cultured in M-CSF-containing medium and proliferated to some degree (Fig. 1⇓B). In contrast, almost all cells from the SSChighCD11bhigh population were granulocytes, whereas lymphocytes constituted the majority of SSClowCD11blow cells. Neither of these populations survived in the culture conditions for macrophages (Fig. 1⇓B). More than 90% of the SSClowCD11bhigh cells were able to phagocytose L. major, whereas only SSChigh granulocytes, but not cells from other sorted populations, showed relevant phagocytic activity (Fig. 1⇓C). Further analysis of the SSClowCD11bhigh population with markers for NK cells (NK1.1), T cells (CD3), or B cells (CD19) showed that the SSClowCD11bhigh population contained no NK cells or lymphocytes (Fig. 2⇓A). In contrast, SSClowCD11bhigh cells uniformly expressed significant levels of M-CSF R. Together, these findings indicate that the SSClowCD11bhigh population in peripheral blood encompasses almost exclusively monocytes on the basis of phenotype, morphology, and function. Phenotypic identification of mouse blood monocytes as SSClowCD11bhigh cells. A, Peripheral blood leukocytes were labeled with CD11b/Mac-1 Ab and analyzed on a flow cytometer. Gated cells (R1, R2+R3, and R2+R4) were separated by cell sorting. B, Cell survival and proliferation after 10 days of stimulation with M-CSF in vitro were analyzed under inverted microscope. C, Sorted cells were incubated for 6 h with L. major promastigotes (1:5 ratio) and then were fixed and stained. The frequency of phagocytic cells was quantified using light microscopy. A representative of three independent experiments is shown. Blood monocytes show heterogeneous expression of Ly-6C. A, SSClowCD11bhigh cells were negative for T- (CD3), B- (CD19), and NK-specific (NK1.1) markers, but uniformly positive for M-CSF R (CD115). They could be subdivided into three populations according to the expression of Ly-6C: Ly-6Chigh, Ly-6Cmed, and Ly-6C−/low. These three subpopulations were separated by cell sorting and showed uniformly monocytic morphology (B) and differential proliferative capacity (C) when stimulated with M-CSF in vitro. D, Monocyte subsets differentially expressed various myeloid and activation markers relative to Ly-6C expression. In particular, CD62L was expressed by Ly-6Chigh monocytes, whereas CD11c and CD43 were expressed by Ly-6Clow monocytes. Representative data are shown for at least four independent experiments. After establishing parameters to discriminate monocytes from other leukocytes by flow cytometry, we tested whether this population displayed phenotypic heterogeneity. 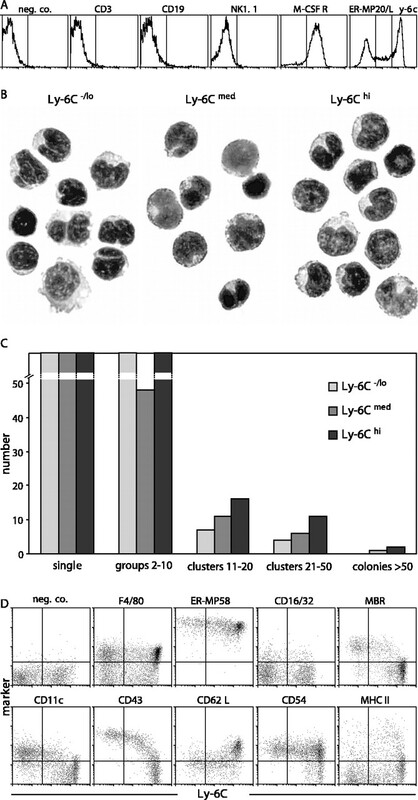 Initial analysis indicated that Ly-6C (ER-MP20) was variably expressed among SSClowCD11bhigh monocytes and allowed the distinction between subpopulations: Ly-6C−/low, Ly-6Cmed, and Ly-6Chigh cells (Fig. 2⇑A). The level of Ly-6C expression found on Ly-6Chigh cells resembles that on BM monocytes (4). Sorting and analysis of SSClowCD11bhigh cells according to the Ly-6C (ER-MP20) expression level showed that virtually all cells presented monocytic morphology (Fig. 2⇑B) and extensive phagocytosis of latex beads and L. major. Analysis of their proliferative activity in M-CSF-containing medium showed that cells from each subpopulation formed several groups of 2–10 cells in culture after a few days. Larger clusters (11–50 cells) and colonies (>50 cells) were most frequently seen in cultures of the Ly-6Chigh population. This indicates that monocytes in all three subpopulations have the capacity to proliferate, but that cells with the highest proliferative potential reside in the Ly-6Chigh population. Cells developing in these cultures were typically adherent and showed macrophage morphology (our unpublished observations). When we applied culture conditions suitable for the development of DC, using GM-CSF and IL-4, cells with morphological characteristics of DC and CD11c and MHC class II expression developed in a few days from all three different subsets (our unpublished observations), in accordance with the previously characterized development of DC from mouse monocytes (8, 17). Further phenotypic characterization of the Ly-6C-defined monocyte subsets showed a uniform high level expression of ER-MP58, characteristic for cells of the myeloid lineage (18) (Fig. 2⇑D). The ability to detect F4/80 varied between experiments, with all subsets expressing the Ag in some experiments, whereas in others no positive subsets were present. In the currently shown profile, most, but not all, monocytes in the different subsets express F4/80. The various subpopulations expressed only marginal amounts of mature macrophage markers such as FcγRII/RIII (CD16/CD32) or scavenger receptor type A (Fig. 2⇑D). However, the subsets did show clear heterogeneity with regard to the expression of CD11c, CD43, and CD62L, with the latter being present primarily on Ly-6Chigh monocytes, whereas CD11c and CD43 were found in particular on Ly-6C−/low cells. Previous studies have indicated that BM monocytes are Ly-6Chigh and that Ly-6C expression is rapidly lost during in vitro development into macrophages or DC (4, 8). Using the same gatings as established for the peripheral blood monocytes, we confirmed that BM monocytes, identified as either SSClowCD11bhigh or SSClowM-CSF R+ cells, were almost exclusively Ly-6Chigh (Fig. 3⇓A). Therefore, we investigated the possibility that Ly-6Chigh peripheral blood monocytes might correspond to BM monocytes, which developed into Ly-6C−/low cells subsequently. In vitro we found that sorted Ly-6Chigh peripheral blood monocytes lost expression of Ly-6C within 3 days (our unpublished observations). Blood monocytes mature from Ly-6Chigh into Ly-6Clow cells. A, Bone marrow monocytes were identified by similar gating as performed on peripheral blood cells (see Fig. 1⇑). They had uniformly high expression of Ly-6C, as reported previously. B, Upon i.v. injection of clodronate liposomes, virtually all peripheral blood monocytes were depleted within 24 h. Recovery to normal numbers of monocytes (identified as SSClowCD11bhigh cells) occurred by 4 days after depletion. C, Analysis of Ly-6C expression by monocytes, gated as SSClowCD11bhigh cells, repopulating the blood after depletion. The first cells reappeared 2 days after clodronate liposome injection and were BM-like Ly-6Chigh monocytes, whereas Ly-6Clow monocytes were detected in the circulation from 7 days after depletion. D, Ly-6Chigh monocytes that reappeared on day 2 after depletion were pulse-labeled in vivo by injecting DiI-loaded liposomes. By 3 days after the DiI labeling, Ly-6Chigh monocytes had developed into Ly-6Clow monocytes, whereas the vast majority of unlabeled monocytes at that time were of the Ly-6Chigh BM type. E, Injection of DiD-loaded liposomes into steady state mice caused all monocytes to disappear temporarily from the circulation within 30 min after injection. Measurable numbers of monocytes were found in circulation 2–4 h later, but these were unlabeled Ly-6Chigh BM-type cells. 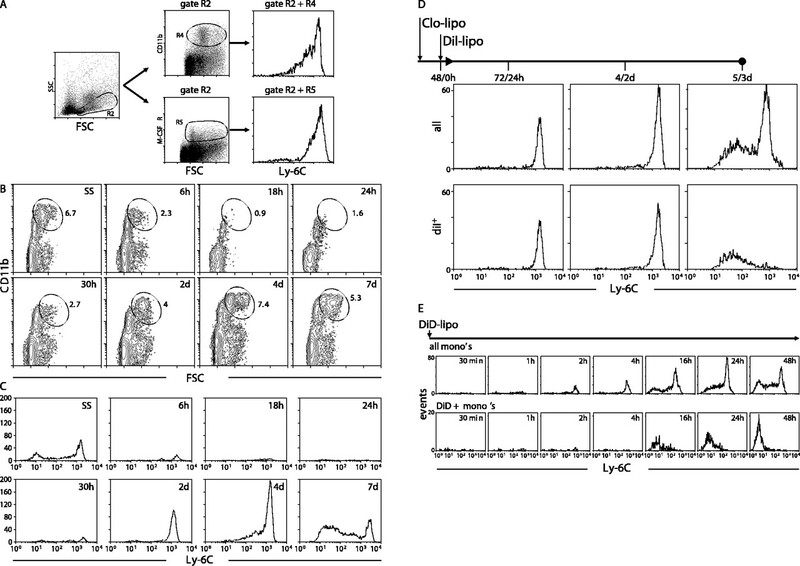 DiD-labeled monocytes were again present 16 h after application of DiD-labeled liposomes and expressed only low levels, if any, of Ly-6C reflecting their relatively mature status. To analyze the subset relationship in vivo we injected mice i.v. with liposomes loaded with clodronate to deplete all phagocytic cells in the circulation and followed the kinetics of monocyte repopulation in the blood. Fig. 3⇑B shows that almost 90% of the SSClowCD11bhigh monocytes were eliminated by this procedure 18 h after liposome injection. This result seemingly contrasts with the reported finding that blood monocytes could be depleted only partially by this method (19). However, in that study monocyte depletion was evaluated only 48 h after depletion, whereas we found that after 24 h monocytes had started to repopulate and had reached normal numbers in 3–4 days (Fig. 3⇑B). The monocytes reappearing at 2 and 4 days after depletion were almost exclusively of the Ly-6Chigh BM phenotype (Fig. 3⇑C). Ly-6C−/low monocytes were found in the circulation in significant numbers only from 7 days after depletion. These findings are consistent with the interpretation that Ly-6Chigh monocytes give rise to Ly-6Cmed and Ly-6C− monocytes. Attempting to approach this maturation sequence more directly, we sorted Ly-6Chigh monocytes from green fluorescent protein (GFP)-transgenic mice and injected these into normal, unconditioned recipients. However, at no time point after transfer could GFP+ cells be retrieved from the circulation of recipient mice, suggesting that manipulation of these Ly-6Chigh monocytes might induce aberrant behavior, leading to rapid margination in vivo. As an alternative approach, we synchronized monocyte development by clodronate liposome-mediated depletion and then labeled reappearing monocytes in vivo to follow their kinetic response. At 48 h after depletion, virtually all circulating monocytes were Ly-6Chigh (Fig. 3⇑C). 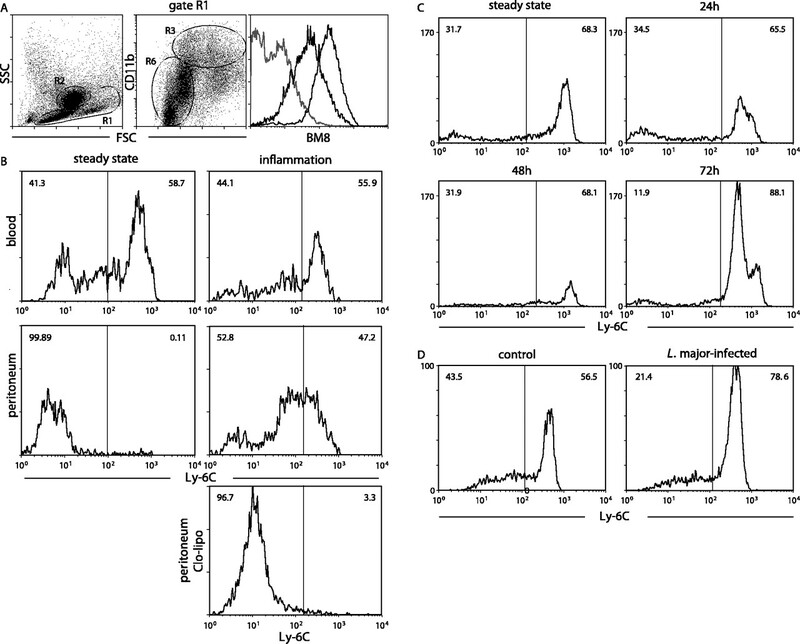 When we then injected fluorochrome (DiI)-labeled liposomes, we found that the vast majority of circulating monocytes became labeled and retained the Ly-6Chigh phenotype for 2 days (Fig. 3⇑D). From 3 days after fluorochrome application, DiI-labeled Ly-6Clow monocytes were observed in the circulation, indicating that these cells had indeed developed from Ly-6Chigh monocytes. In contrast, the vast majority of Ly-6Chigh monocytes were not labeled at this point, demonstrating that they had been released into circulation after the fluorochrome pulse labeling. These experiments strongly support the concept that monocytes enter the circulation from the BM as Ly-6Chigh cells and then develop into Ly-6C−/low monocytes before emigrating into peripheral tissues. To follow the kinetics of the distinct monocyte populations in steady state, we attempted to label all monocytes by i.v. injection of fluorochrome (DiD)-labeled liposomes. Unexpectedly, we found that all monocytes, identified as SSClowCD11bhigh cells, disappeared from the circulation within 30 min after liposome injection (Fig. 3⇑E) suggesting that phagocytosis of liposomes triggered monocyte margination. Monocytes started to reappear after 2–4 h, but these cells were not DiD-labeled, indicating that they were not in direct contact with the circulation when the liposomes were injected. Presumably, these cells resided in the BM and entered the circulation after the liposomes were injected. This was confirmed by the observation that these cells were of the Ly-6Chigh BM monocyte phenotype. From 16 h on, DiD-labeled monocytes, all of which were Ly-6C−/low, were found in the peripheral blood. Because the previous experiments showed that Ly-6Chigh and Ly-6C−/low monocytes had similar phagocytic activity of L. major in vitro and clodronate liposomes in vivo, it is unlikely that the Ly-6Chigh cells did not take up the DiD-labeled liposomes. Thus, these results suggest that the Ly-6Chigh cells matured into Ly-6C−/low monocytes within the 16- to 48-h period. These experiments do not formally exclude, however, that only labeled Ly-6C−/low monocytes reappear in circulation, whereas Ly-6Chigh monocytes have a different destination. Previous studies have shown that monocytes recruited to peripheral inflammatory sites typically show a high level expression of Ly-6C (20, 21). In view of our current findings, we asked whether this was due to a selective recruitment of immature BM-type monocytes. Therefore, sterile inflammation was elicited by i.p. injection of FCS. In the steady state peritoneal cavity, we observed that monocyte-like SSClowCD11bhigh cells were present, characterized by an intermediate expression of the macrophage marker BM8, well below that of resident peritoneal macrophages (Fig. 4⇓A). These resident peritoneal monocytes were uniformly lacking Ly-6C (Fig. 4⇓B). In contrast, the first inflammatory monocytes examined 18 h after FCS injection clearly showed significant Ly-6C expression (Fig. 4⇓B). By comparison, the ratio between monocyte subsets in peripheral blood was unchanged. This suggested that Ly-6Chigh immature monocytes were selectively recruited to the site of inflammation, in accordance with recent findings (14). In contrast, immigration of Ly-6Chigh monocytes was blocked completely when the inflammatory trigger was given to mice that were simultaneously depleted of circulating monocytes by i.v. injection of clodronate liposomes (Fig. 4⇓B). The latter finding also indicates that FCS injection does not induce Ly-6C expression in resident peritoneal monocytes. Selective contribution of Ly-6Cmed/high monocytes to the inflammatory response. A, BM8 expression of monocyte-like SSClowCD11bhigh cells (R1 + R3) in the peritoneal cavity at steady state is less than that of resident peritoneal macrophages (R2). The histogram showing the lowest BM8 expression is from SSClow cells with low or no CD11b expression (R1 + R6). B, Sterile inflammation induced by i.p. injection of FCS 24 h previously recruited specifically Ly-6Cmed/high monocytes to the site of infection. This cellular influx is abolished by i.v. injection of clodronate liposomes at the same time as i.p. injection of FCS. C, Acute systemic infection with L. monocytogenes caused initial depletion of circulating monocytes during the first 48 h after infection, followed by specific accumulation of Ly-6Chigh monocytes, resulting in a noticeable monocytosis by 72 h. D, Chronic parasitic infection with L. major, analyzed at 4 wk after infection, stimulated a shift toward Ly6Chigh monocytes in the blood. To investigate the monocyte subset kinetics in acute bacterial inflammation, we infected mice with L. monocytogenes. Fig. 4⇑C shows that the ratio between Ly-6Chigh and Ly-6Cmed/low monocytes did not change in the first 48 h after infection, but the absolute number of circulating monocytes decreased during this time. In contrast, there was a significant influx of Ly-6Chigh monocytes 72 h after infection, causing a notable monocytosis in the blood with a shift toward the immature Ly-6Chigh subset. To test whether chronic infection caused a similar shift in the monocyte balance, C57BL/6 mice were infected s.c. with L. major. After 4 wk, chronic infection was established as indicated by marked swelling of footpads and by dissemination of parasites into draining lymph nodes. At this stage also a significant shift was found toward the Ly-6Chigh immature monocyte subset (Fig. 4⇑D). Taken together, these findings confirm the idea that inflammatory monocytes are exclusively Ly-6Cmed/high cells. Furthermore, both acute and chronic infection are reflected in the blood by a shift in the balance between monocyte subsets toward the immature Ly-6Chigh BM type. The circulating monocyte compartment in the mouse has been studied to only a limited extent due in part to the limited number of available cells and the lack of solid criteria to identify this cell type. In this study we characterized mouse peripheral blood monocytes in genetically nonmanipulated animals using an approach that is generally applicable in both steady state and experimental conditions. To identify monocytes among peripheral blood leukocytes, we used criteria that are universally recognized as characteristic of mononuclear phagocytes (22). These are 1) mononuclearity, seen as low orthogonal light scatter in the flow cytometer; 2) myeloid nature, shown by high level expression of CD11b; 3) uniform phagocytic potential; and 4) the ability to develop into macrophages upon M-CSF stimulation. Application of these criteria indicated that monocytes in mouse peripheral blood were restricted to the SSClowCD11bhigh population and that this population included no other cells. These cells were uniformly positive for the M-CSF receptor (CD115), a proposed universal marker for mononuclear phagocytes (1). This way we identified ∼6% of circulating leukocytes in the steady state as monocytes. With total leukocyte counts of ∼10.106/ml, this amounts to 6 × 105 circulating monocytes/ml of mouse blood, which is consistent with earlier data (23). In previous studies, Lagasse and Weissman used high level expression of CD11b, the absence or low level expression of Gr-1 and low SSC as discriminating criteria for monocytes and identified these cells as a single population (11). Similarly, Henderson and colleagues (12) found mouse monocytes to be a homogeneous population using high level expression of the myeloid marker 7/4 and intermediate expression of Gr-1 as discriminating criteria. In contrast, Geissmann and colleagues (14) recently recognized distinct subsets among circulating monocytes in CX3CR1GFP/+ mice which differed in phenotypic and functional characteristics. In accordance with these results, we distinguished monocyte subsets in normal mice according to differential expression of Ly-6C (ER-MP20), CD62L, CD11c, and CD43. Cells of each subset showed extensive phagocytic activity, displayed typical monocytic morphology and developed into macrophages in vitro upon M-CSF stimulation. Thus, each population of SSClowCD11bhigh leukocytes, distinguished by variable Ly-6C expression, contains bona fide monocytes. To date a possible relationship between these monocyte subsets had not been addressed (13, 14). Using various approaches, we found that the monocyte subsets differing in Ly-6C expression represent different stages in a continuous maturation pathway. As such, recent immigrants from the BM enter circulation as Ly-6Chigh monocytes, consistent with their BM-like phenotype (4), and gradually down-regulate Ly-6C expression while still in the bloodstream. In vitro studies indicate that this transition is performed within 24–48 h (4, 8). Under steady state conditions in vivo peripheral blood monocytes were estimated to have a similar average transit time in circulation of ∼25 h (24). Our study provides evidence in support of such kinetics, because 16–24 h after labeling monocytes with DiD in vivo, most monocytes were unlabeled and therefore recent immigrants, whereas labeled monocytes had developed into mature Ly-6C−/low cells within this time span. However, when we analyzed the kinetics of monocyte maturation in the circulation under certain inflammatory conditions, we found that it differs from steady state. When the forced release of monocytes from the BM during inflammation was simulated in a phagocyte depletion model, most Ly-6Chigh cells remained in the circulation for >2 days before maturing into Ly-6Clow cells. This is probably due to the fact that monocytes are released in a less mature state under conditions of peripheral phagocyte depletion or inflammation. These cells might need more time to acquire a minimal level of maturation, which is necessary before they can emigrate from the circulation and undergo further differentiation. Typically, only 4 days after depletion, the first repopulating macrophages and DC are observed in peripheral organs, in particular spleen and liver (25) (our unpublished observations). Do the different monocyte subsets have different developmental capabilities? 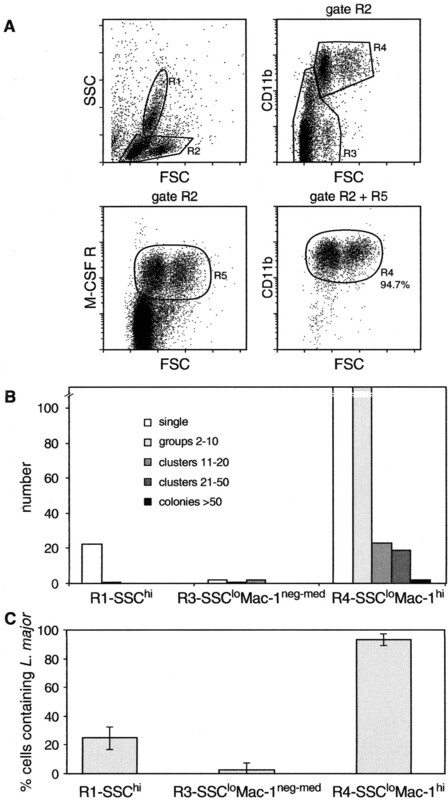 Stimulation with M-CSF in vitro resulted in the development of macrophages from all subsets (Figs. 1⇑ and 2⇑). Similarly, all subsets acquired DC-like morphology and phenotype when stimulated in vitro with GM-CSF and IL-4. Therefore, the different monocytes seem to share a similar developmental potential. Recent in vivo transfer experiments show that Gr-1− monocytes, corresponding to mature Ly-6C−/low cells, reside longer in peripheral tissues of uninflamed recipient animals compared with Gr-1+ monocytes, which correspond to Ly-6Chigh cells (14). The more mature Ly-6C−/low monocyte subset shows enhanced or induced expression of CD11c and CD43 Ags. Increased expression of CD43 and stimulation via CD43 have been shown to be associated with DC maturation in humans and rats (27) (28). In addition, there was a clear phenotypic resemblance between the mature Ly-6C−/low monocytes and the recently identified CD11cintCD45RA− pre-DC1, circulating DC precursors in the mouse (26). Thus, the increased CD43 expression by the Ly-6C−/low monocytes together with induced CD11c expression probably reflect the maturation of these cells into a monocyte subtype with high potential to develop into DC. The immature, Ly-6Chigh subset of monocytes is characterized by a higher level of L-selectin (CD62L+) expression compared with Ly-6C−/low monocytes. Given that CD62L mediates recruitment of leukocytes (29), we tested whether differential expression of this molecule was also manifested in differences in recruitment of the different subsets during an elicited peritoneal inflammation. We observed that the inflammatory Ly-6Chigh monocytes (20, 21), but not the Ly-6C−/low monocytes, were recruited into acute inflammation. Recently, Palframan et al. (13) identified two populations of F4/80-positive mononuclear cells in peripheral blood of heterozygous CX3CR1GFP/+ mice, of which only one subset expressed CD62L and was recruited to lymph nodes draining inflamed skin. In accordance, Geissmann et al. (14) showed preferential migration of the CD62L+Gr-1+CCR2+ monocyte subset, which corresponds to our Ly-6Chigh population, into the peritoneal cavity during thioglycolate-induced inflammation in CX3CR1GFP/+mice. We found in preliminary studies that Ly-6Chigh monocytes express elevated levels of CCR5 and CXCR4 compared with the mature Ly-6−/low monocytes. Together, these findings clearly show that particularly the immature Ly-6Chigh monocytes, but not the mature Ly-6−/low monocytes have a high potential to migrate to inflammatory sites. Peripheral inflammation stimulates the production of monocytes in the BM and their subsequent release into circulation. When this is substantial, there is a skewing of the monocyte population toward a higher frequency of immature Ly-6Chigh cells. This can be considered a so-called left shift in the monocyte compartment comparable to that seen in the neutrophil compartment, when more immature bandforms are found during acute inflammation. Such a monocytic left shift is typically observed after 72 h during primary infection with L. monocytogenes. It results in greatly increased numbers of monocytes in circulation, whereas the BM is fully occupied with myelopoiesis (9). We observed a significant skewing toward immature cells also in chronic infection caused by L. major. This probably reflects the increased myelopoiesis that is long recognized in chronic infection with L. major (30). The identification of distinct monocyte subsets in the mouse raises the question of how these relate to monocyte subsets present in humans. A recent comparison between human and mouse monocytes indicated that CX3CR1low (our Ly-6Chigh) monocytes correspond to the classical CD14highCD16− monocytes, whereas CX3CR1high (our Ly-6C−/low) monocytes resemble CD14lowCD16high cells (14). Interestingly, in human patients with sepsis an increase has been observed of CD64+ monocytes, which primarily correspond to the major subset of CD14+16− monocytes (31). In analogy to our findings in infected mice, this might represent a so-called left shift toward immature monocytes also in severe inflammations in humans. Taken together, in this study we identify different subsets of mouse monocytes in peripheral blood, which behave differently depending on host conditions. Our data indicate that the cells enter the circulation from the BM as Ly-6Chigh cells. Under steady state conditions, monocytes mature in circulation, which is reflected in strong down-regulation of Ly-6C and up-regulation of CD43 expression. In peripheral inflammation, however, only Ly-6Cmed/high monocytes are recruited to the affected sites to become inflammatory exudate macrophages. Increased monocytopoiesis under these circumstances is apparent from the increased frequency of immature Ly-6Chigh monocytes, which may be considered a left shift in the monocyte compartment. The destiny of the Ly-6C−/low monocytes remains more speculative at present. Their phenotypic change suggests maturation toward DC with increased CD43 expression facilitating stimulation through this receptor to become more mature DC. Furthermore, the anti- and proadhesive properties of CD43, depending on the presence of the appropriate ligands (32), suggest a more selective homing pattern for the mature Ly-6C−/low monocytes compared with the immature Ly-6Chigh monocytes. Many people were important in the genesis of this study. We thank Tar van Os for preparation of the figures; Eva Nattkemper, Ruth Goez, Berlinda den Broeder, Karin Fischer, and Meike Steinert for technical support; and Jeremy Gill for his enthusiastic input. We are grateful to Ellen van Lochem for advice on human monocyte development, and to Jim Henthorn (William K. Warren Medical Research Institute) for expert assistance with flow cytometry and cell sorting. Dr. Nishikawa is thankfully acknowledged for making available the anti-M-CSF R Ab. ↵1 This work was supported by research grants from the Deutsche Forschungsgemeinschaft (SFB 293, Project A8 (Su)), the Dutch Diabetes Research Foundation (Grant 96.606), and a Merit Review Grant from the Department of Veterans Affairs. ↵2 C.S., T.N., D.A.D., and P.J.M.L. contributed equally to this work. ↵4 Abbreviations used in this paper: DC, dendritic cell; BM, bone marrow; clodronate, dichloromethylene-bisphosphonate; GFP, green fluorescent protein; M-CSF R, M-CSF receptor; SSC, side scatter. Hume, D. A., I. L. Ross, S. R. Himes, R. T. Sasmono, C. A. Wells, T. Ravasi. 2002. The mononuclear phagocyte system revisited. J. Leukocyte Biol. 72:621. Grage-Griebenow, E., H. D. Flad, M. Ernst. 2001. Heterogeneity of human peripheral blood monocyte subsets. J. Leukocyte Biol. 69:11.
de Bruijn, M. F. T. R., W. A. T. Slieker, J. C. M. van der Loo, J. S. A. Voerman, W. van Ewijk, P. J. M. Leenen. 1994. Distinct mouse bone marrow macrophage precursors identified by differential expression of ER-MP12 and ER-MP20 antigens. Eur. J. Immunol. 24:2279. Kennedy, D. W., J. L. Abkowitz. 1998. Mature monocytic cells enter tissues and engraft. Proc. Natl. Acad. Sci. USA 95:14944. Randolph, G. J., K. Inaba, D. F. Robbiani, R. M. Steinman, W. A. Muller. 1999. Differentiation of phagocytic monocytes into lymph node dendritic cells in vivo. Immunity 11:753. Agger, R., M. S. Petersen, H. E. Toldbod, S. Holtz, F. Dagnaes-Hansen, B. W. Johnsen, L. Bolund, M. Hokland. 2000. Characterization of murine dendritic cells derived from adherent blood mononuclear cells in vitro. Scand. J. Immunol. 52:138. Nikolic, T., M. F. T. R. de Bruijn, M. B. Lutz, P. J. M. Leenen. 2003. Developmental stages of myeloid dendritic cells in mouse bone marrow. Int. Immunol. 15:515.
de Bruijn, M. F. T. R., W. van Vianen, R. E. Ploemacher, I. A. Bakker-Woudenberg, P. A. Campbell, W. van Ewijk, P. J. M. Leenen. 1998. Bone marrow cellular composition in Listeria monocytogenes infected mice detected using ER-MP12 and ER-MP20 antibodies: a flow cytometric alternative to differential counting. J. Immunol. Methods. 217:27. Biermann, H., B. Pietz, R. Dreier, K. W. Schmid, C. Sorg, C. Sunderkotter. 1999. Murine leukocytes with ring-shaped nuclei include granulocytes, monocytes, and their precursors. J. Leukocyte Biol. 65:217. Lagasse, E.., I. L. Weissman. 1996. Flow cytometric identification of murine neutrophils and monocytes. J. Immunol. Methods 197:139. Henderson, R. B., J. A. Hobbs, M. Mathies, N. Hogg. 2003. Rapid recruitment of inflammatory monocytes is independent of neutrophil migration. Blood 102:328. Palframan, R. T., S. Jung, G. Cheng, W. Weninger, Y. Luo, M. Dorf, D. R. Littman, B. J. Rollins, H. Zweerink, A. Rot, et al 2001. Inflammatory chemokine transport and presentation in HEV: a remote control mechanism for monocyte recruitment to lymph nodes in inflamed tissues. J. Exp. Med. 194:1361. Geissmann, F., S. Jung, D. R. Littman. 2003. Blood monocytes consist of two principal subsets with distinct migratory properties. Immunity 19:71. Leenen, P. J., K. Radosevic, J. S. Voerman, B. Salomon, N. van Rooijen, D. Klatzmann, W. van Ewijk. 1998. Heterogeneity of mouse spleen dendritic cells: in vivo phagocytic activity, expression of macrophage markers, and subpopulation turnover. J. Immunol. 160:2166.
van Rooijen, N., A. Sanders. 1994. Liposome mediated depletion of macrophages: mechanism of action, preparation of liposomes and applications. J. Immunol. Methods 174:83. Schreurs, M. W., A. A. Eggert, A. J. de Boer, C. G. Figdor, G. J. Adema. 1999. Generation and functional characterization of mouse monocyte-derived dendritic cells. Eur. J. Immunol. 29:2835.
de Bruijn, M. F. T. R., R. E. Ploemacher, A. E. M. Mayen, J. S. A. Voerman, W. A. T. Slieker, W. van Ewijk, P. J. M. Leenen. 1996. High-level expression of the ER-MP58 antigen on mouse bone marrow hematopoietic progenitor cells marks commitment to the myeloid lineage. Eur. J. Immunol. 26:2850. Zhang-Hoover, J., A. Sutton, N. van Rooijen, J. Stein-Streilein. 2000. A critical role for alveolar macrophages in elicitation of pulmonary immune fibrosis. Immunology 101:501. Jutila, M. A., F. G. Kroese, K. L. Jutila, A. M. Stall, S. Fiering, L. A. Herzenberg, E. L. Berg, E. C. Butcher. 1988. Ly-6C is a monocyte/macrophage and endothelial cell differentiation antigen regulated by interferon-gamma. Eur. J. Immunol. 18:1819. Chan, J., P. J. Leenen, I. Bertoncello, S. I. Nishikawa, J. A. Hamilton. 1998. Macrophage lineage cells in inflammation: characterization by colony-stimulating factor-1 (CSF-1) receptor (c-Fms), ER-MP58, and ER-MP20 (Ly-6C) expression. Blood 92:1423.
van Furth, R., Z. A. Cohn, J. G. Hirsch, J. H. Humphrey, W. G. Spector, H. L. Langevoort. 1972. The mononuclear phagocyte system: a new classification of macrophages, monocytes, and their precursor cells. Bull. W. H. O. 46:845.
van Furth, R., W. Sluiter. 1986. Distribution of blood monocytes between a marginating and a circulating pool. J. Exp. Med. 163:474. Van Furth, R., M. C. Diesselhoff-den Dulk, H. Mattie. 1973. Quantitative study on the production and kinetics of mononuclear phagocytes during an acute inflammatory reaction. J. Exp. Med. 138:1314.
van Rooijen, N., N. Kors, G. Kraal. 1989. Macrophage subset repopulation in the spleen: differential kinetics after liposome-mediated elimination. J. Leukocyte Biol. 45:97. O’Keeffe, M., H. Hochrein, D. Vremec, B. Scott, P. Hertzog, L. Tatarczuch, K. Shortman. 2003. Dendritic cell precursor populations of mouse blood: identification of the murine homologues of human blood plasmacytoid pre-DC2 and CD11c+ DC1 precursors. Blood 101:1453. Corinti, S., E. Fanales-Belasio, C. Albanesi, A. Cavani, P. Angelisova, G. Girolomoni. 1999. Cross-linking of membrane CD43 mediates dendritic cell maturation. J. Immunol. 162:6331. Delemarre, F. G., P. G. Hoogeveen, M. De Haan-Meulman, P. J. Simons, H. A. Drexhage. 2001. Homotypic cluster formation of dendritic cells, a close correlate of their state of maturation: defects in the biobreeding diabetes-prone rat. J. Leukocyte Biol. 69:373. Rainer, T. H.. 2002. L-selectin in health and disease. Resuscitation 52:127. Mirkovich, A. M., A. Galelli, A. C. Allison, F. Z. Modabber. 1986. Increased myelopoiesis during Leishmania major infection in mice: generation of ‘safe targets,’ a possible way to evade the effector immune mechanism. Clin. Exp. Immunol. 64:1. Schinkel, C., R. Sendtner, S. Zimmer, E. Faist. 1998. Functional analysis of monocyte subsets in surgical sepsis. J. Trauma 44:743. Ostberg, J. R., R. K. Barth, J. G. Frelinger. 1998. The Roman god Janus: a paradigm for the function of CD43. Immunol. Today 19:546.